These flavor-packed tofu kebabs are made with summer veggies and tofu soaked in a spicy Mediterranean-inspired marinade. 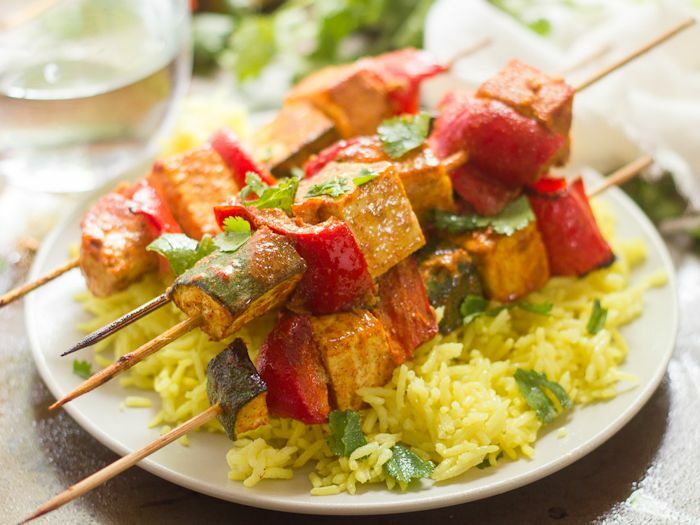 Cook them up on the grill or in the oven and served over spiced basmati rice. I say this every year and here I am saying it again: I’m a terrible vegetable gardener. I think I’ve figured out that I don’t take it seriously enough. I bought a bunch of plants and stuck them into the ground a few weeks ago. Among them are tomatoes, peppers, a few herbs, and something else that I can’t identify with certainty yet. Whatever it is, it’s cruciferous and not cauliflower. The lady I bought it from at the farmstand didn’t know what it was (apparently I’m not the only one who doesn’t take my garden seriously), but I decided to buy it anyway because I like to live on the edge. The farmstand lady also gave me some free pea plants, which I think are a spring plant so I wasn’t so sure about taking them…but they were free, so why not? I didn’t get to find out how peas hold up in the heat because a baby bunny ate all of my pea plants. I did nothing to stop him. How can I deny a baby bunny a snack? Gardeners must have nerves of steel. Othewise though, things aren’t looking too bad this year. So I’m working on lots of recipes that are filled with veggies in anticipation of the motherload springing forth from my backyard in a couple of months. 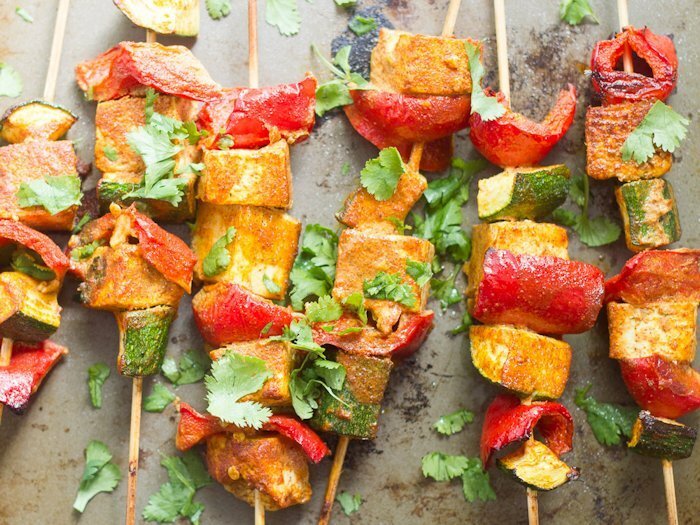 Veggie kebabs are great because they work with just about anything. If those pepper plants don’t make it, cherry tomatoes would do just fine. No zucchini? Use eggplant instead. And if you’re a really bad gardener like me, you don’t even have to grow it yourself, so the pressure is off. The marinade and tofu are the important parts here. Coconut milk might seem like a weird base for something Mediterranean-y, but you really can’t taste the coconut at all. I even tried a few different versions of the marinade, and coconut won, hands down. You can grill or bake these too. Grilling is my favorite way to eat them (lots of smoky flavor), but when it comes time to get cooking I usually go with the oven for ease. In a medium bowl stir together the coconut milk, lemon juice, tomato paste, garlic, paprika, cumin, turmeric, cayenne, salt and pepper. Add the tofu, zucchini, and pepper and gently stir to coat. Allow to marinate at room temperature for at least 1 hour. 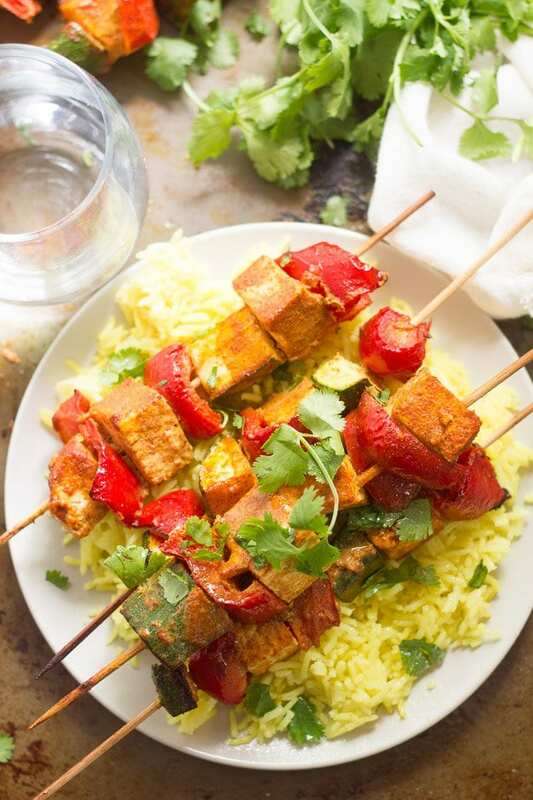 Arrange the tofu zucchini, and pepper pieces on skewers. To grill: lightly oil the grate and and place the skewers on the grill. Grill over a medium flame until lightly charred and the veggies are tender, about 10 minutes, brushing with excess marinade while grilling and turning halfway through. To bake: Preheat the oven to 400° and line a baking sheet with parchment paper. Arranger the skewers on the parchment-lined baking sheet and bake unit lightly browned in spots and the veggies are tender, about 35 minutes, turning halfway through. 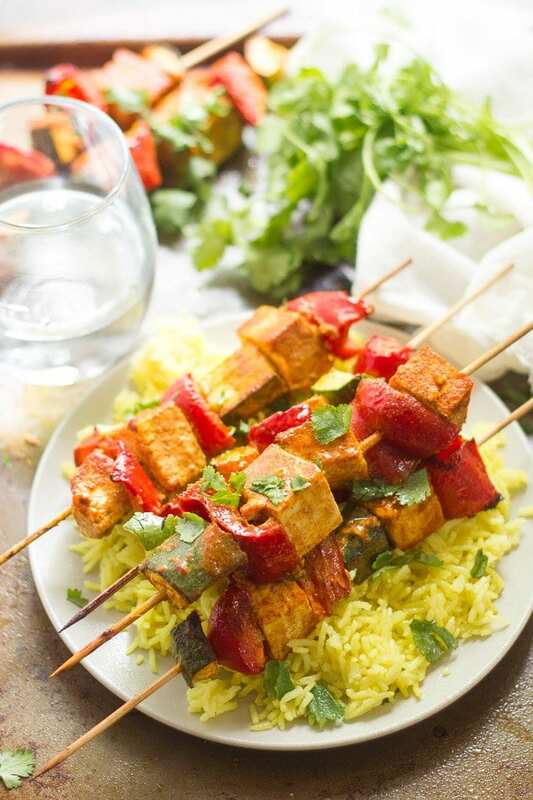 Divide the skewers onto plates, sprinkle with cilantro, and drizzle with tahini. Serve. I got lots of mystery plants in my garden. XD I bought them and wasn’t smart enough to save the little label. Second recipe from your site this week. This was EXCELLENT!! Paired with turmeric rice as you suggested. Spot on! Definitely to be repeated. And a bonus- chopped and rolled in a flour tortilla for brekkie the next morning. I am even more enamored!